The term food chain refers to the sequence of events in an ecosystem, where one organism eats another and then is eaten by another organism. It starts with the primary source like the sun or hydrothermal vents where producers make food, continues with consumers or animals who eat the food, and ends with the top predator. A food chain is a sequence of events in nature in which one organism eats another, and is then eaten by another in turn. All food chains start with the primary source, either the sun or chemicals produced by hydrothermal vents deep in the ocean. When an organism uses those sources to make food, it starts the food chain. The process continues to the organisms that eat that plant or animal, then the organism that eats what ate it, all the way to the apex predator, an organism that eats others but is not eaten itself. Here, we have brought together a collection of examples of food chains for you to study. Food chains are the basic unit of any ecosystem, connecting with one another to form the food webs that map the interactions of life on Earth. Life on Earth is a big deal. Read up! 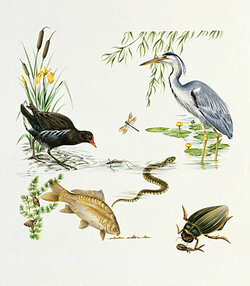 Land-based food chains represent the most familiar forms of nature to humans. Everything ultimately derives its energy from the sun, and most food chains follow the pattern "herbivore, carnivore, maybe another carnivore or two, apex predator." But there is an almost endless diversity within that pattern and even a few chains that break it. One fascinating break in that pattern is the omnipresent decomposer. Organisms ranging from bacteria and maggots to the noble cockroach feed on the dead, and in doing so break them down into the nutrients that keep the food chain going. By eating and excreting, decomposers return the nutrients of dead organisms to the soil, which nourishes the plants that start the chains all over again. Aquatic food chains are where things get interesting. Much of the ocean remains unexplored, and food chains in water-based environments are often complex and surprising to us land-dwellers. The most famous example is chemosynthesis, which we'll cover later. But even the aquatic food chains that follow expected patterns can be fascinating. Decomposers play a crucial role here too, as aquatic decomposers distribute nutrients not just into the soil, but throughout the water column, feeding the plankton that form the base of all aquatic food chains. Until the 1970s, it was accepted scientific fact that all energy on Earth comes from the sun. Every food chain was based on plants turning sunlight into energy. Then, deep-sea submersibles discovered whole ecosystems that existed in the darkest depths of the ocean. There, microbes that never saw the sun derived nutrients from compounds vented into the water from deep in the Earth's crust and produced chemicals that supported whole new food webs never dreamt of on the surface. That's chemosynthesis. Here are some examples. All plants and animals are part of a food chain. These examples of food chains are only a small part of the vast food webs that span our world. They simply represent the variety of plants and animals, and the complexity of interactions, that make up the amazing diversity of life on Earth. Now you've learned about life on Earth, read up about the landforms that make up the Earth's surface. "Examples of Food Chains." YourDictionary, n.d. Web. 18 April 2019. <https://examples.yourdictionary.com/examples-of-food-chains.html>.